I remember visiting the area once and will never forget the "sacred" feeling all around. The mountain is covered with old sacred sugi pine trees, which give it a rather dark look. The gods of Mt. Miwa are also regarded as gods for rain. is a mountain located in the city of Sakurai, Nara Prefecture, Japan. It has been an important religious and historical mountain in Japan, especially during its early history, and serves as a holy site in Shinto. and is home to one of the earliest Shinto shrines, Ōmiwa Shrine. Several burial mounds from the Kofun period can be found around the mountain. Religious worship surrounding Mount Miwa have been deemed the oldest and more primitive of its kind in Japan, where the very mountain itself is designated sacrosanct. The kami generally associated with Mount Miwa is Ōmononushi (Ōmono-nushi-no-kami), a rain kami. However, the Nihon Shoki notes that there was a degree of uncertainly when it came to naming the principal kami of Mount Miwa. Yamato leaders often ruled from palaces near sacred mountains, and built burial mounds around them. The kami residing on Mount Miwa was judged the most powerful by the Fujiwara clan, and consequently palaces and roads were built in the vicinity. have been found in the Shiki area at the base of Mount Miwa. These earthen mounds were built between 250 CE to 350 CE, and all display the same keyhole shape and stone chambers found in earlier mounds. However, the tumuli found at Mount Miwa hint at the beginning of a more centralized Yamato state. All six mounds are exceptionally large, twice as large as any similar mounds found in Korea, and contain prolific amounts of mirrors, weapons, ornaments, as well as finely built wood and bamboo coffins.
. Mimuro no yama み室の山 - 三室山 . The Ōmiwa shrine complex includes notable auxiliary shrines (setsumatsusha), including 12 Sessha (摂社 auxiliary shrine) and 28 massha (末社 branch shrine) which are marked by small structures falling under Ōmiwa's jurisdiction. For example, the sessha Ikuhi jinja enshrines the kami who was appointed Ōmiwa's sake brewer in the 4th month of the 8th year of the reign of Emperor Sujin.
. . . Omononushi-no-okami enshrined in Omiwa Jinja Shrine(大神神社) in Nara Prefecture is also the deity of Sake. The sacred tree of the shrine is a Japanese cedar tree. Ikuhi Jinja Shrine (活日神社) which is an auxiliary shrine of Omiwa Shrine is dedicated to Takahashi no Ikuhi no Mikoto(高橋活日命). According to the Chronicle of Japan, he made good sake as an offering to the deity by order of Emperor Sujin and was enshrined as a deity of Toji(杜氏, chief sake brewers) in the shrine. Sake, the drink of the Gods in Japan from the very beginning of its appearance in Japan, was a part of early religious rites that were the prototype of what is identified as the Shinto religion today. It was used to purify the temple and formed an important to the gods. Sake is believed to have first brewed around 300 B.C. in Japan a few centuries after wet rice cultivation was introduced in that country. The oldest Shinto shrine is said to be the Omiwa Jinja in Nara Prefecture, which houses Matsuo-sama, the primary god of Saké brewing. Matsuo-sama, the main saké-brewing deity has shrines dedicated to him inside Japanese breweries. 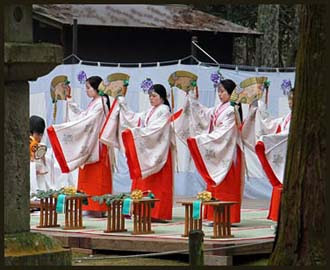 A Shinto ritual called O-miki is performed by a priest who sips saké from a white porcelain cup at the altar. It is believed that he is taking a bit of the god-force into himself and becoming at one with the gods. The sugi cedar from the grounds of this shrine are traditionally used to create all of the sugidama and holds special significance in the Shinto religion. Tanks for Saké brewing were once made of sugi wood as were the masu, small boxes used as cups. It was thought that sugi would prevent the Saké from spoiling. holds special significance in the Shinto religion. The oldest Shinto shrine is said to be the Omiwa Jinja in Nara Prefecture, which houses Matsuo-sama, the primary god of Saké brewing. The sugi from the grounds of this shrine are traditionally used to create all of the sugidama.
. . . An earlier Uzumasa, Uzumasa-no-Kimi-Sukune, was recorded as the first leader of the Hata to arrive in Japan–during the reign of Emperor Chūai, in the 2nd century CE. According to the epic, he and his followers were greeted warmly, and Uzumasa was granted a high government position. and more about the acitvities of the Hata clan.
. Shrines related to Sake　酒 and o-miki　お神酒 . A form of Shinto belonging to the tradition of Ryōbu Shintō that developed primarily at Byōdōji and Ōgorinji (Ōmiwadera), temples serving as the "parish temples" (jingūji) of Ōmiwa Shrine in Nara Prefecture. The founder of Byōdōji, Kyōen (also read Keien, 1140-1223) is usually considered the creator of Miwa-ryū Shintō. However, while the Miwa Shōnin gyōjō, his only certain biography, does mention a few events related to the kami, it contains no indications that Kyōen established a clearly defined form of Shintō. Thus, scholars suggest that Miwa-ryū Shintō actually arose later in history. It is not clear to what extent this form of Shintō had existed during Kyōen's lifetime, but from the fact the Miwaryū jingi kanjō shi ki was copied in 1266, we know that the tradition had been developing since at least the mid-Kamakura period. However, the existence of Miwa-ryū Shintō at Miwa can be clearly attested only from the time of the reconstruction of the Ōgorinji (Ōmiwadera) —the original jingūji of Miwa shrine— by Eison (1203-1290); subsequently, Miwa Shintō developed there thanks to the efforts of Eison and members of his order (Saidaiji-ryū). The Saidaiji-ryū order also played an important role in the development of Ryōbu Shintō at Ise after Eison's pilgrimage to the Grand Shrines of Ise; it is thus likely that Eison's monastic order was responsible for a massive introduction of Ryōbu Shintō to Miwa. 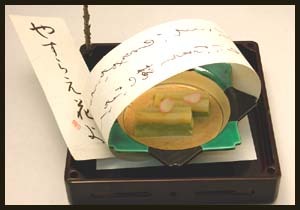 Among the early texts of Miwa-ryū Shintō is the Miwa Daimyōjin engi composed in 1318. It states that the kami of Ōmiwa is identical in essence to Amaterasu, thus attempting a fusion with the doctrines of Shinto practiced at Ise. Subsequently, the transmission of Miwa-ryū Shintō occurred especially at Byōdōji and Ōgorinji. Since the Kanekuni hyakushu uta shō (composed in 1486) mentions the Shinto of "Miwa Kyōen Shōnin" as one of the "four Shinto traditions" (shintō shiryū), we can assume that its existence was widely known by the mid-Muromachi period. Nevertheless, most Miwa-ryū texts existing today date from the Edo period, and many of them show the influence of Yoshida Shintō; as a result, we know little about the actual aspect of this tradition during the medieval period. However, with the publication of the Miwa sōsho and, more recently, of Miwa-ryū texts in the Ōmiwa jinja shiryō collection (vols. 5, 6, and 10), many primary sources have become more easily accessible. Further, studies such as Miwa-ryū Shintō no kenkyū, edited by the Ōmiwa Shrine, have also begun to appear, and we can expect new developments in research on this tradition in the near future.
. Yoshida Shinto 吉田神道 . Ritus zur "Beruhigung der Blumen"
This is an old ritual dating back to the Heian period. The god of epidemic diseases 行疫神（ぎょうやくじん） had to be appeased by scattering cherry blossoms in the wind. Thus pestilence in the Yamato region could be prevented. Held at the shrines Omiwa and Sai. The deity of epidemic diseases was believed to live on Mount Miwa. The cherry blossoms, which begun to scatter during this time, were also seen as the flowers of the rice plants and farmers prayed that they would not fall down. This name "appeasing the blossoms" remained the name for the festival to our day. After praying at Omiwa Shrine, the priests go to Sai shrine, which is dedicated to Princess Isuzu. The shrine has a famous well and the water is sold during the festival. This festival is also performed at other shrines in Japan. At another shrine, Mizutani Jinja 水谷神社 in Nara, a performance of kagura to "appease the blossoms" was held on the 5th day of April.
. . . CLICK here for Photos of Mizutani Shrine! Special cake with cherry blossoms, served during the festival. This posthumously discovered hokku is without a date, but it is a New Year's hokku and must have been written after Issa began living back in his hometown. During that time he didn't visit Mt. Miwa, which is in the Nara area, far from his hometown. Perhaps the hokku is based on a memory of a sunrise he saw when he passed through the area many years earlier. Mount Miwa is a low but very sacred mountain revered by the ancient Yamato people and probably by earlier inhabitants of the area. Like a few other mountains in Japan, including Mt. Fuji (believed to be the body of Konohana Sakuya-hime, the female god of tree blossoms), Mt. Miwa is not the home or the visiting place of a god but is itself the actual god. Thus at the Miwa Shrine complex below Mt. Miwa there is no Shinden or God Hall with an object representing the god, since the mountain itself is the god. Different shamanic and Shinto traditions have overlapped in the long history of this shrine, but anciently the god appears as a great snake. In mythic texts politically edited by the Yamato court, the name of the god of the mountain is Oo-mono-nushi, and he is assimilated to the earlier snake worship, acting as a god governing rain, thunder and lightning, and the fertility of rice fields. In recent years some scholars have hypothesized that the shrine below Mt. Miwa, which faces east toward the mountain, was part of a sun-worshiping belief system involving other mountains in the Nara area. In any case, viewed from the shrine, the sun rises from behind Mt. Miwa in spectacular fashion, as if the mountain were giving birth to the sun. Mt. Miwa was not a sun god in Issa's time, but the sight of the sun rising from behind the mountain must have been deeply moving, making the mountain seem to be truly the visible body of a god. There are also two lesser Shinto gods who are worshiped at the shrine, but they are not the Miwa mountain god. Miwa (三輪) means Three Rings. Its etymology is unclear, but it may be related to the three torii or god-arches placed between the Hall of Worship and the slope of the god-mountain beyond the back of the hall. Only Shinto priests are allowed to go through these arches on their way to say prayers to the mountain. The shrine is also called Oo-Miwa-Jinja, with "Miwa" being written in characters that mean "Great God," but the word Miwa refers to the mountain itself and does not literally mean "Great God." This special use of characters indicates that at Mt. Miwa the mountain itself is a great god.
. Saikusa matsuri 三枝祭 Saikusa lily Festival .
. The snake - water sprout at Miwa Shrine .